Medardo Rosso (1858–1928) is one of the most original and influential figures in the history of modern art, and this book is the first historically substantiated critical account of his life and work. An innovative sculptor, photographer, and draftsman, Rosso was vital in paving the way for the transition from the academic forms of sculpture that persisted in the nineteenth century to the development of new and experimental forms in the twentieth. His antimonumental, antiheroic work reflected alienation in the modern experience yet showed deep feeling for interactions between self and other. Rosso’s art was transnational: he refused allegiance to a single culture or artistic heritage and declared himself both a citizen of the world and a maker of art without national limits. In this book, Sharon Hecker develops a narrative that is an alternative to the dominant Franco-centered perspective on the origin of modern sculpture in which Rodin plays the role of lone heroic innovator. Offering an original way to comprehend Rosso, A Moment’s Monument negotiates the competing cultural imperatives of nationalism and internationalism that shaped the European art world at the fin de siècle. Sharon Hecker is an art historian specializing in Italian modern and contemporary art. Based in Los Angeles and Milan, she is a leading authority on Medardo Rosso and has published extensively on Lucio Fontana and Luciano Fabro. 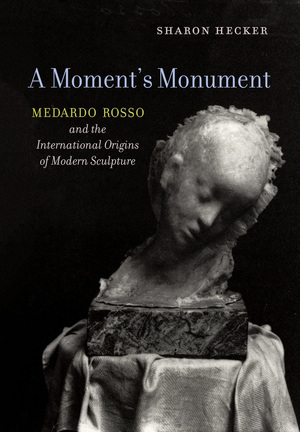 Her publications include Medardo Rosso: Second Impressions.